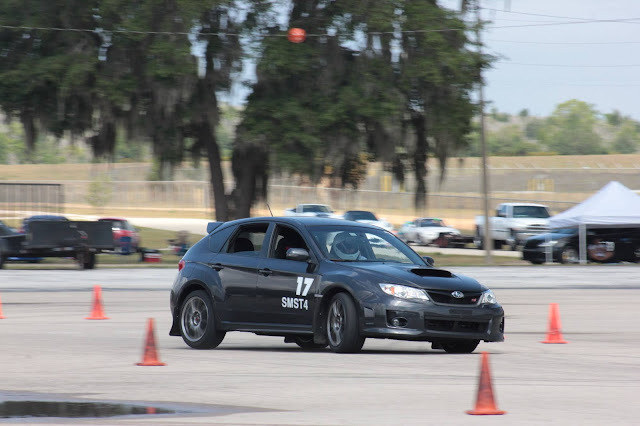 One of our Sponsored Drivers, Nathan Adair, has been aggressively campaigning his 2014 Subaru Impreza WRX STI hatch in local Autocross events for the last 3 years. Circuit Motorsports has assisted in the tuning and build-up of this STI, including an autocross-geared tune. This STI put down an amazing 321hp/371tq. to the wheels, on stock turbo and with mild bolt-ons! * Read on to see the details on the mods, and for the many class wins Nathan has brought home. Nathan competes in the extremely competitive SMST4 class, which is a Street Mod class, with a restriction on tires for 200 treadwear an above. 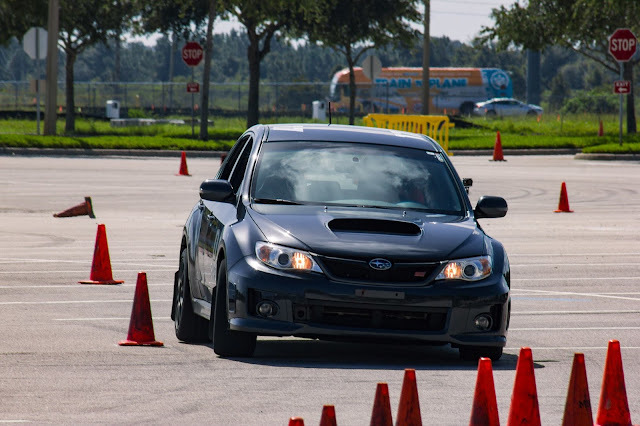 This is a great class for a modified street car, as the use of expensive slicks is not allowed, and the allowed modifications are much wider than the other street classes an STI would fall into. The rules allow for a lot of suspension mods, ECU tuning, and most engine bolt-ons. We took full advantage for mods and tuning, with power mods including a Cobb Accessport, full turboback exhaust, upgraded fuel pump and boost controller. The exhaust includes a very sweet Tomei full titanium catback, which weighs substantially less than the heavy OEM assembly. The catback also has a flow through design, and sounds very aggressive when the hammer is down. Moving on, the focus on tuning was on low end-torque delivery and leaving a safety margin. Having a swell of torque down low really helps with tight autocross courses, where hard acceleration is needed to get from gate-to-gate on a course as fast as possible. "Straightaways" are rare on most courses, so being able to put power down anywhere possible is very important for a fast time. Peak torque is right around 3800rpm, and there is a very broad range of power to be had in the middle of the rev range. Ideal for the type of racing this STI is used for! Power is great to have, but keeping your engine healthy and alive is even more important when every race in a season counts. It is for this very reason (and to keep our client's wallets happy) that we tune with a margin for safety, especially with a car being used in competition. 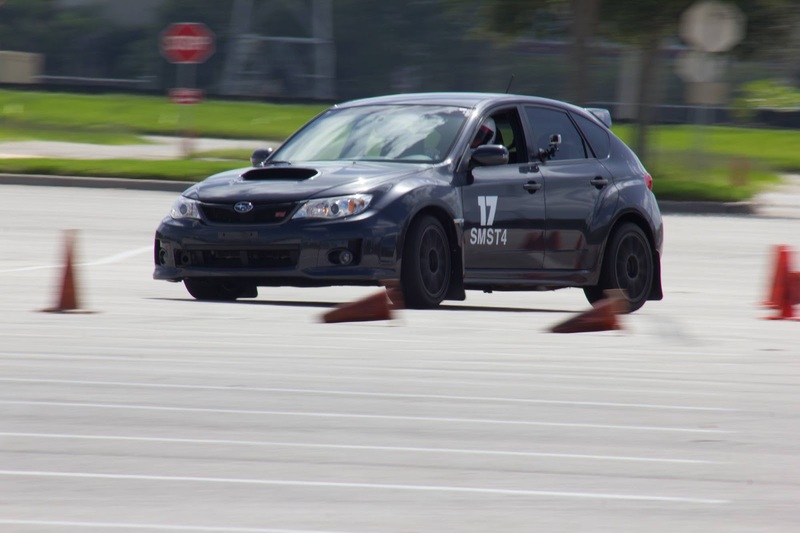 Autocross, while normally a shorter sprint style event as compared to endurance racing, is hard on a car. Especially when that car lives and races in a very hot climate like Central Florida. Heat is a constant issue to deal with, as heat can kill a car. Fuel, coolant, oil, and intake temps all rise with use, and even with upgraded cooling capacity the battle to keep a car cool is constant. This needs to be taken into account when tuning, because if a tune is completed to eek out every last ounce of horsepower in a cooler controlled environment, then that same tune is used in an uncontrolled competition environment, bad things can happen. Explosive things. Dialing in horsepower, with a margin for safety is the ideal way to go about a tune for this type of vehicle and its preferred use. This is our philosophy with tuning; Making horsepower, while keeping it safe. We also prefer to take our time and be sure everything is dialed in and correct before sending it on it's way. This helps to ensure it makes power and lives a life longer than a few hard events. Nates' STI was tuned by us in June of 2014 and has since been to more than 50+ autocrosses, 1 track day, 3 trips to "The Tail of the Dragon" in NC, and has been used as a daily driver in between. Approximately 35,000 miles have rolled over on the odometer since our initial tuning and engine mods. Power alone won't win races, which is why we suggest modding the car as a whole to compliment your driving style and conditions. For Nates' STI we decided to address the brakes first with a set of Hawk HP+ pads, Stoptech Stainless steel lines, Motul fluid, and a Brake Master Cylinder Brace. The Hawk pads provide better stopping power and more bite than the OEM pads, and the Motul fluid will last much longer than the OEM fluid will under hard use and heat. The Stainless lines and brace provide better pedal feel and feedback, which helps braking confidence. To further tighten up the feel of the car we installed Group N engine and trans mounts, Trans cross-member bushings, Rear diff inserts, steering rack bushings, and our own Pitchstop and Clutch Master Cylinder Brace. The bushings and mounts all work together to tighten up the drive-train and remove the slop the soft OEM bushings allow. More power is put to the wheels instead of being soaked up by unnecessary drive-train movement and the throttle response is much crisper, it's a win-win. Our own Clutch Master Cylinder Brace which we designed and manufactured helps to tighten up the clutch pedal feel AND it can help prevent the dreaded firewall welds from breaking and leaving you stranded, so that was a no-brainer to include for this car! 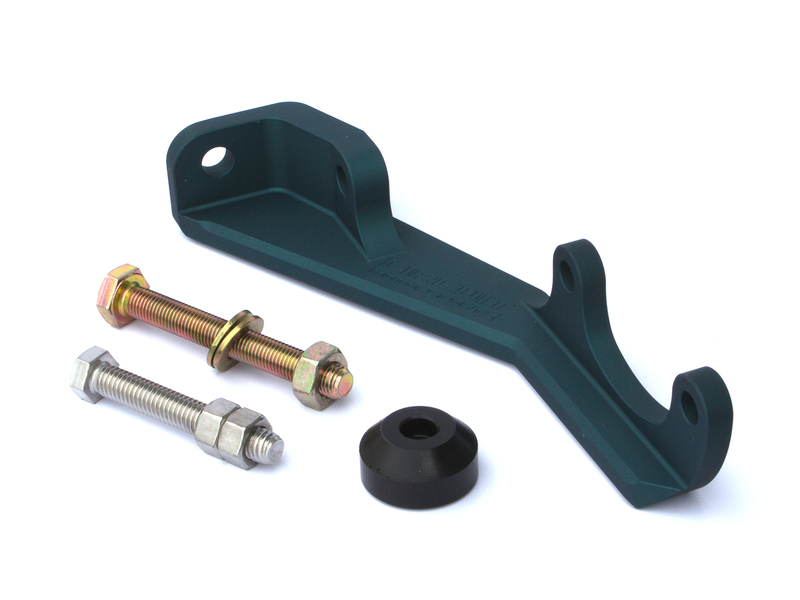 Our Clutch Master Cylinder Brace. 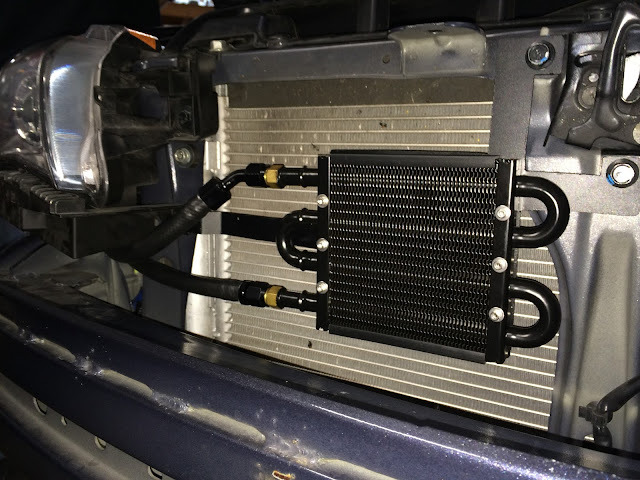 Further Chassis mods included our own Power Steering Cooler Kit, which includes a Derale compact fluid cooler core. The 2008-2014 STis suffer from steering delay and lock-up because the power steering fluid gets too hot and becomes too thin to properly move through the power steering system. Our Kit cools the power steering fluid as it travels through the core, and helps prevent steering lock issue. 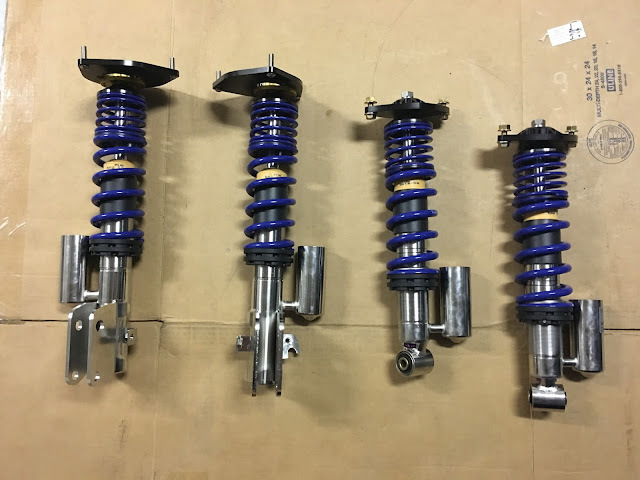 With that problem handled we moved onto making the car handle better, and the main component for this would be a set of Racecomp Tarmac2 Coilovers, with 500lb/in front, 550lb/in rear springrates and front camber plates. 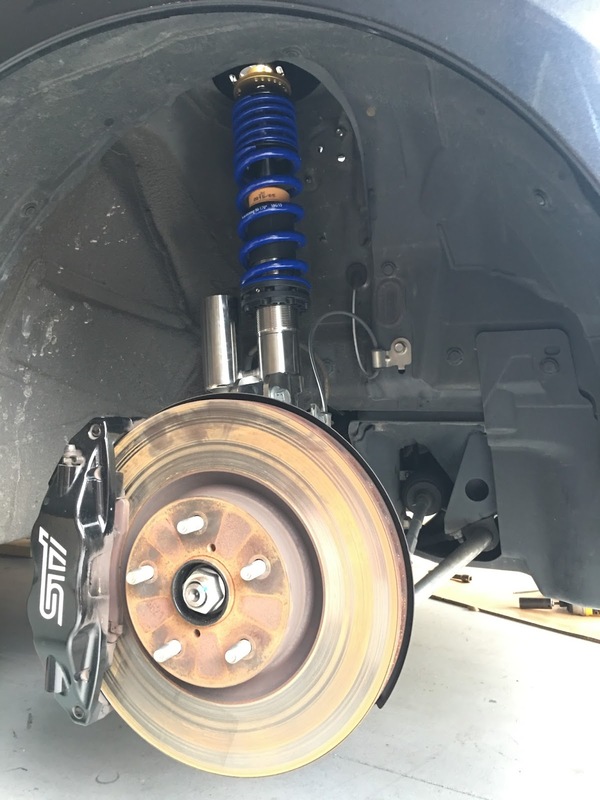 These are great coilovers that feature height adjustment, and both compression and redouble adjustment. These adjustments allow for fine tuning of the suspension to compensate for different surface conditions , tires, etc. A set of 22mm Whiteline swaybars front and rear, with accompanying endlinks, rounded out our suspension upgrades. The car corners and handles amazing as compared to the factory suspension with these mods in place, job done! So with all this in place, how does the car do? Pretty well. So far in just the 2017 season alone Nate has brought home two class wins and an overall win/Fast Time of Day in his STI. For previous seasons he has an impressive amount of 1st, 2nd, and 3rd place wins in his class and overall. He continues to compete and improve both himself and the car, with no project ever being "done". We still see Nate regularly for maintenance and upkeep, which should never be ignored! The engine oil is also tested for any signs of wear or issues, and all tests have come back good to go. We are always happy to see customers' using their cars for fun and enjoying what we have helped build for them! *Tuned on a Mustang 500 Dyno, in "Dynojet mode"